Yalda Alexandra Saii – Lekha Ink, Corp.
Yalda Alexandra Saii is an avid reader, writer, and a student of Lekha Writing Center, which she has attended since 2009. Her short stories and creative works have been published in numerous anthologies, including Adventures of the Imagination, the annual Lekha student anthology. The Sassy Divas is her first solo novel. Yalda began writing The Sassy Divas during a Lekha class when she was ten years old, and completed it at the age of twelve. Her passion for writing is ever-growing, and she hopes to publish many more books in the future. 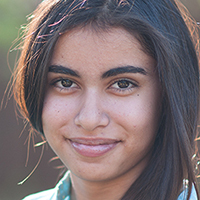 Currently, Yalda lives with her family in the San Francisco Bay Area, and goes to school in the Silicon Valley.